We all know the Periodic Table of chemical elements, where elements like helium and oxygen (literally can't think of any other elements) are ordered by their atomic number, electron configurations and properties. 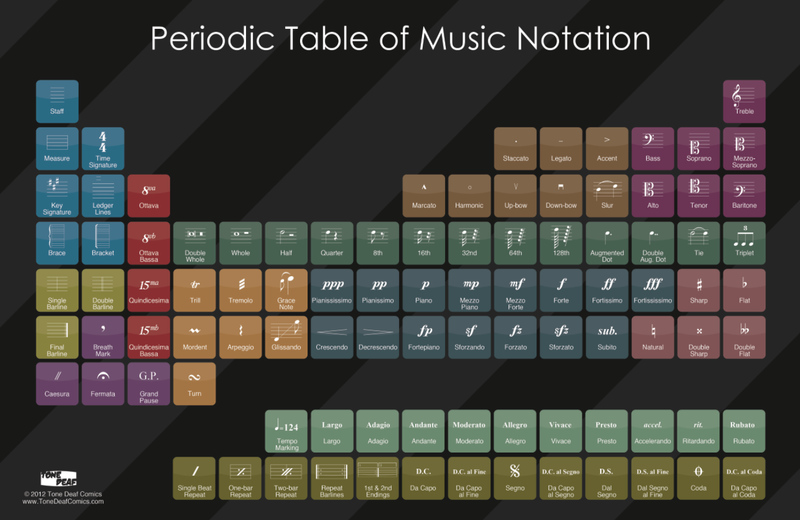 But what if we did that for music notation? How cool would that be? Well, Tone Deaf Comics have stepped up. The result is pretty spectacular and rather geeky. Musical notation in its groups - from time and key signatures, through ornamentation, accidentals and form. Learn it by heart and be a better musician. Recite it at social occasions to impress your friends. Bravo to Tone Deaf Comics - this is seriously impressive. If you fancy it, you can buy the poster here. Here's some incredible Ysaye. How many (musical) elements can you name?